As evening approaches, the streets of Sindhi Colony come alive with hungry folks rushing to get their fix of street food. Whether you’re looking for pizzas or kulfi and even chocolate dipped paan, there’s a little something for everyone here. Planning to do a food crawl with your mates? Then you are totally sorted for here’s a little guide to eating the best in Sindhi Colony. It’s surprising how the moment Chachaji opens its kiosk at 4 pm, people start gathering for their share of vada pav. 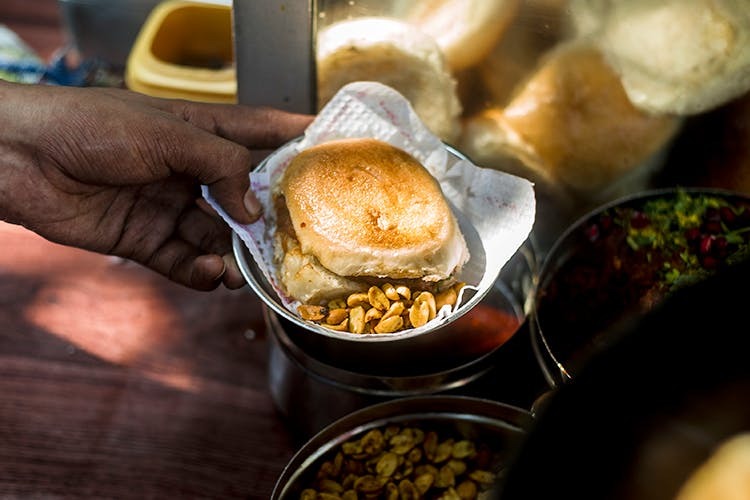 But what we really love here and go back again and again to devour is his dabeli, a Gujarati dish where masala potatoes, sev, and pomegranate are generously stuffed between two masala pavs. These are served with chili, onions, and homemade tomato chutney which make the dish spicy yet tangy. We’ve been gorging on the delicious snacks at Famous Raju Chat Bhandar for ages now. Walk towards his kiosk and you’ll see a big crowd gathered around this pani puri place. We warn you, this place might give you a fix for all your street food craving, so, leave some space in that tummy of yours to eat more. You must absolutely try the bhelpuri here – spicy, sweet, sour – it gets a nod from us for all the right things. Pizza Den is a modest kiosk with no seating whatsoever but you’ll be surprised to find the number of people who gather here for pizza and ice cream. Beyond 7pm, you’ll have to struggle to cut through the crowd to even place an order. However, it’s worth the wait. Although an all-vegetarian affair, this den hooks you with its Creamy Cheese Pizza, Veg Exotica, and Deluxe Veggie. Go for their softy with cake in flavours like Death By Chocolate or Mango Fantasy. Although Mayur has multiple branches across the city, we heart this one for its Butter Aloo Toast and Strawberry Juice (which comes with chunks of strawberry) or Mango Juice (seasonal). This one is also a small store, which is colossally crowded at all times. But munching on their hot goodies and fusion sandwiches like Tava Sandwich will make it worth standing on the side of the street and eating. As the name suggests, Dimmy is popular for its paan. Although it makes all kinds of chaat, we recommend Dimmy for its ice golas and flavoured paan. Ask for a Kalakhatta gola and walk away in glee. But if you’re interested in trying their paan, go for the Chocolate or Chocolate Laddu Paan. Dessert lovers, if you haven’t tasted the kulfi here, well, you’ve tasted nothing at all. Stocking over 100 varieties of kulfi, this store is a haven for us. Pick a flavour of your choice and wait – you’ll be served chunks of kulfi on a plate. If you’re confused about what to pick, we recommend the Gulkand Special, Fresh Anjeer (seasonal), Fig & Almond. Want to try all too many? Then ask for two or more flavours together. Ever tried soda in more than 20 flavours? If not, welcome to Famous Live Soda which makes soda in many flavours. Right from the basic Fresh Lime Soda and Jeera Soda to interesting ones like Blueberry and Whiskey, this kiosk has it all. We suggest you try the Rimjhim Soda or the Pudina Soda.